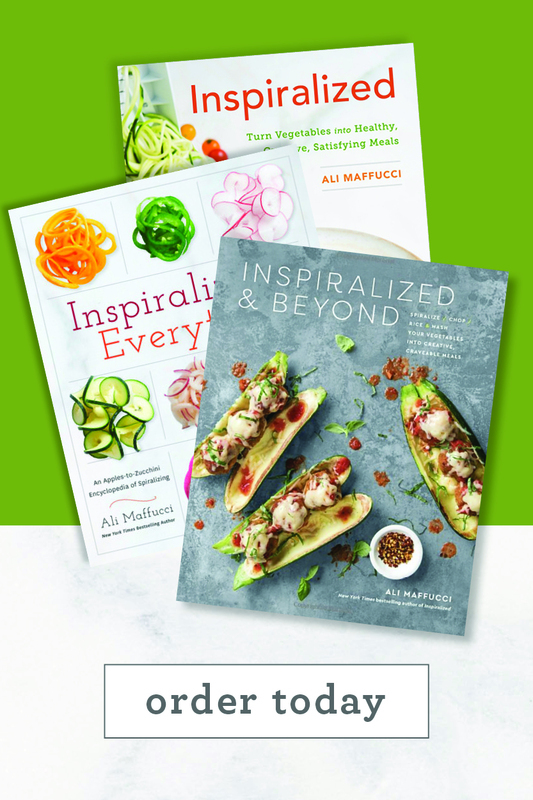 Spiralizing isn’t just for making noodles out of vegetables and cooking low carb pasta dishes. 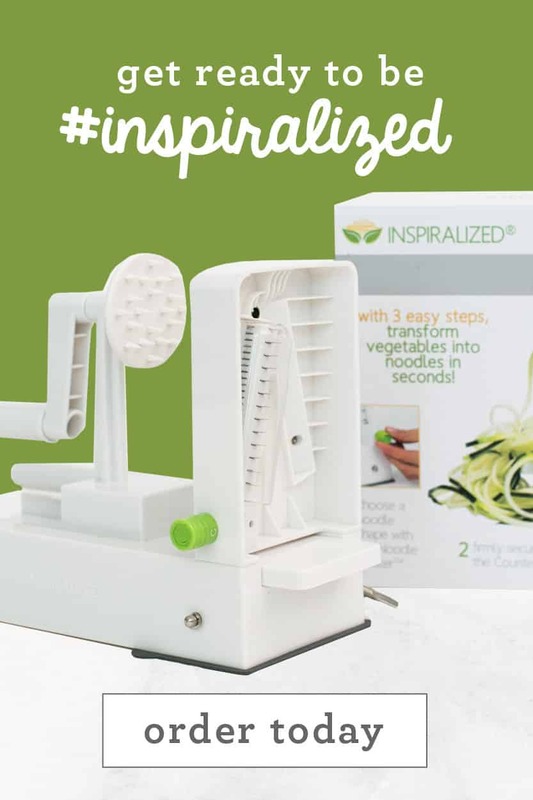 The Inspiralizer is also a quick and easy way to shred and slice vegetables. 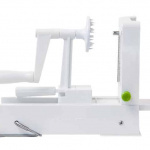 You can shred cabbage and slice apples into thin slices, replacing the need for a mandolin. 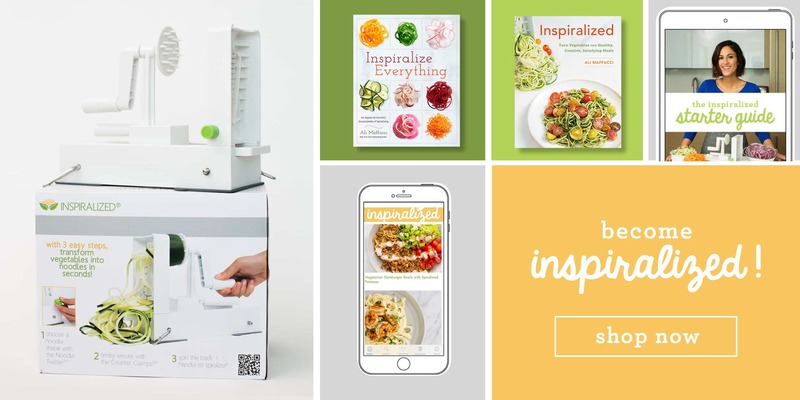 I love using the Inspiralizer on apples, because it’s hard to get perfectly thin slices. 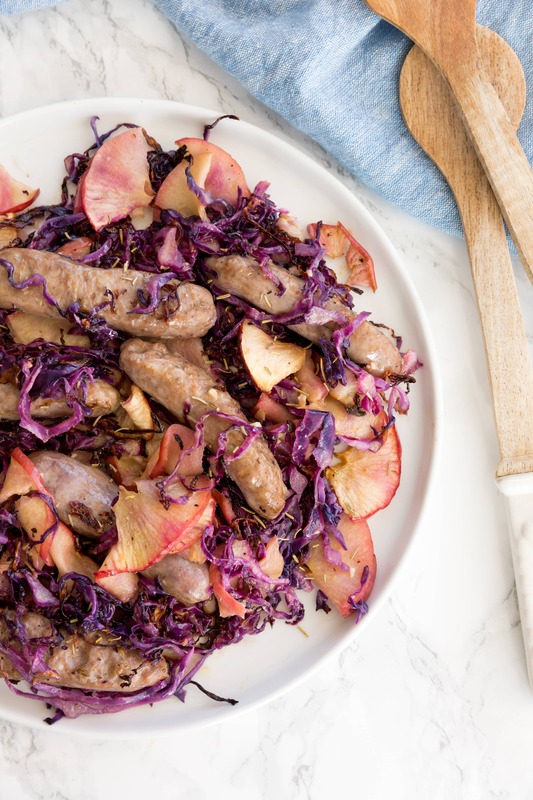 These slices can be used in savory meals like this Sausage with Cabbage and Apples, or in a sweet dish, like an apple pie or tart. Shredding cabbage has never been easier! 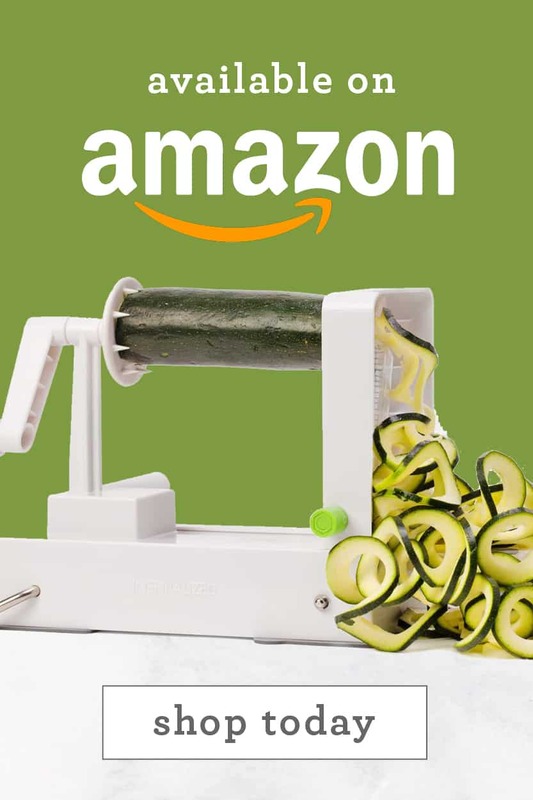 In a few seconds, you can effortlessly shred an entire head of cabbage into equal shreds. 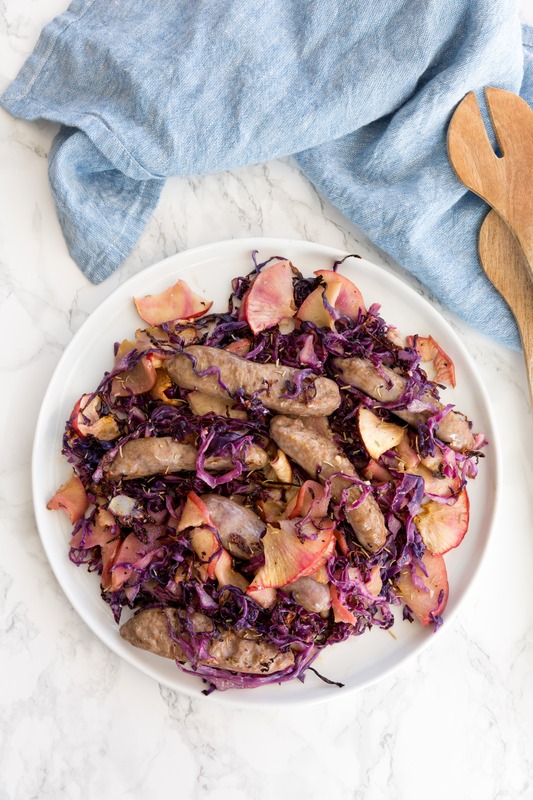 This combination of cabbage, apples, and sausage is so flavorful and the perfect balance of salty and sweet. The sausage juices cook with the cabbage and apples, softening the apples and the cabbage absorbing the flavors. It can be enjoyed as is, or even as a side dish at a gathering. 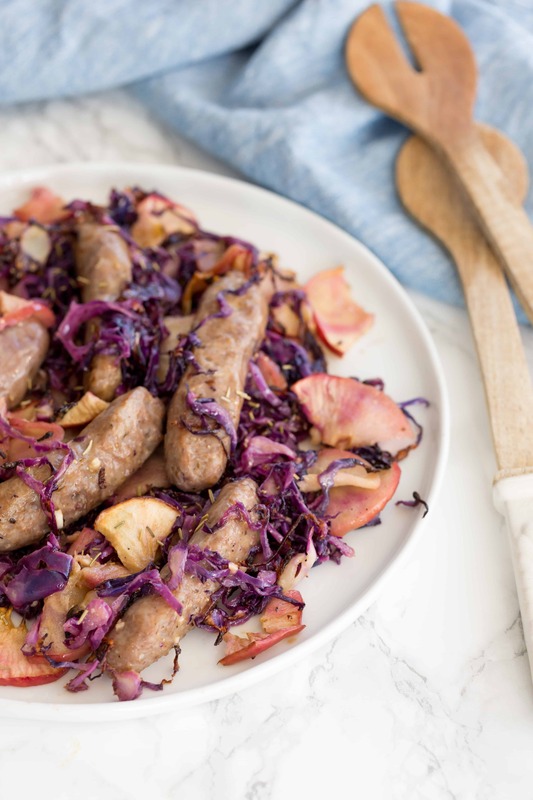 The pink and purple colors give life to the otherwise brown sausage, and the sprinkle of rosemary at the end ties all of the flavors together. Place the cabbage and apple on the baking sheet. Drizzle with the 2 tablespoons of oil and season with salt and pepper. Toss lightly to coat. Bake until crisp-tender, about 15 minutes. Add the sausage and gently toss together. Bake until the cabbage and apple are tender and sausage is cooked, about 10 minutes. While sausage cooks, whisk the oil, mustard, honey, vinegar, and garlic. Set aside. When the cabbage and sausage is done cooking, transfer to a serving bowl and drizzle with vinaigrette. Garnish with rosemary. Serve. Ali, I made this tonight. Absolutely delicious! I will definitely make this again. 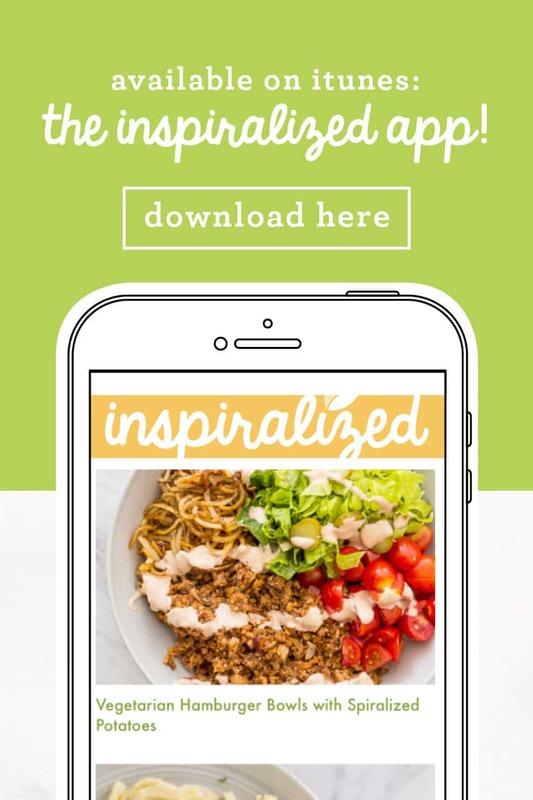 I’m having a problem with my Inspiralizer, though. It worked great on the Formica kitchen counter in my old house, but it won’t lock down on the copper counter where I live now. Any ideas?? Hi Wendy! 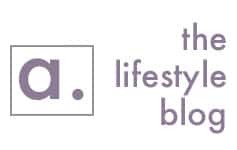 Hmm - if you have any other marble or glass surface give it a try there or maybe a marble slab. If you still have a problem send a note to [email protected] and she should be able to help you! Hi Carly...I don’t have marble or glass that would be appropriate for food prep. I will contact Meaghan, as you suggested. Thanks for your reply! Just made this with vegan sausage...so yummy! 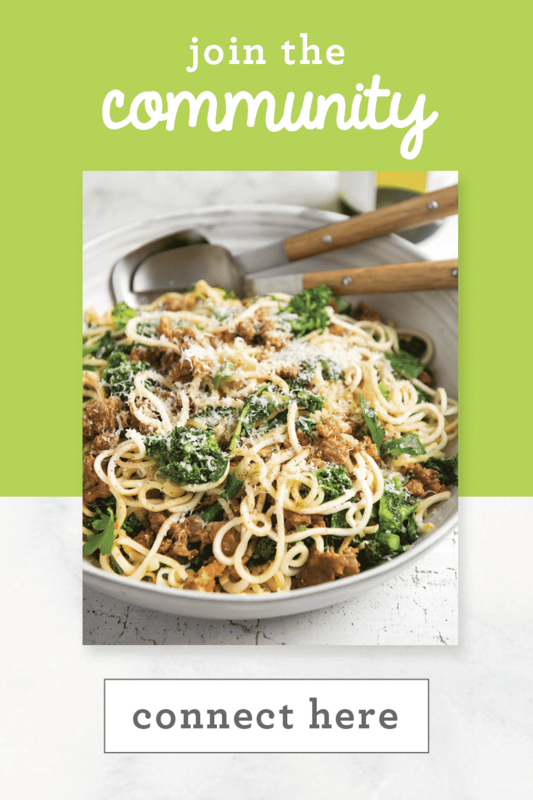 Made this recipe this week, subbing kale for cabbage because we aren't huge cabbage fans and adding some butternut squash because we had extra (butternut squash went in with the first round and kale in with the sausage). It was VERY good, especially the dressing. 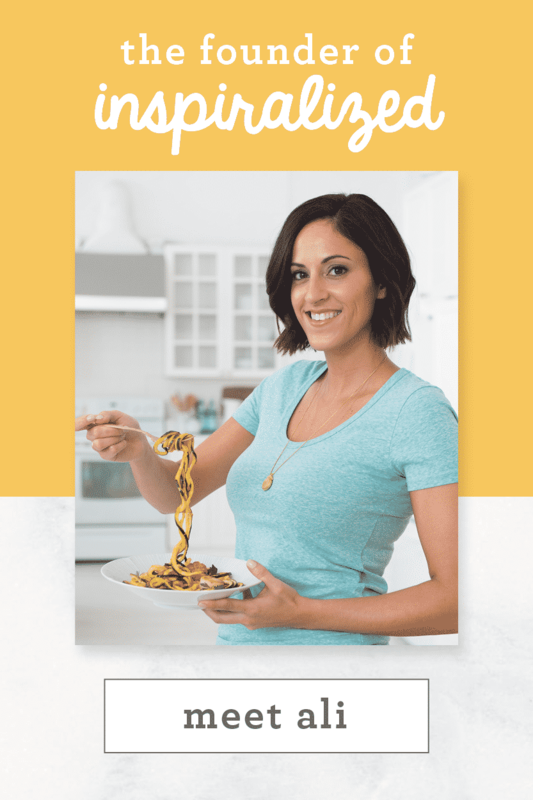 This one will be worked into my rotation for default, easy dinners. Wow great idea! Sounds delicious!